THE GURGLING COD: Setagaya - Protect ya Neck! As an egg (white on the outside, yellow on the inside), when I tell people that I go out for Japanese 1-2 times a week, I almost always get the response, "have you ever been to Momofuku?" Um, no, I said I went out for JAPANESE food. 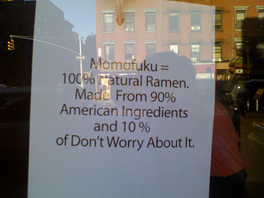 I think that Momofuku being synonomous to good Japanese in NYC is what grates.....Its like when people think Veselka is "good Ukrainian food."